LOS ANGELES -- Amid surfers and skaters, a tiny blue butterfly has scored a telling victory in its fight against extinction. The rare El Segundo blue has returned to two popular beaches southwest of Los Angeles where it has not been seen in decades. This is no mere academic sighting of a rare species. Scientists say they are surprised at the resurgence. Dozens of the rare butterflies are thriving, not in some rarefied fenced-off reserve but in public view at county beaches in Redondo Beach and Torrance. "You could open the car door, and they could hit you in the face," said conservation specialist Travis Longcore recently, gesturing at creatures no bigger than a thumbnail flitting a few feet away. In a summer that has marked the delisting of the American bald eagle as an endangered species, news of the tiny butterfly's reappearance is stirring hope that other species will rebound. The El Segundo blue, one of the region's best-known endangered species, is found nowhere in the world but the southeastern shores of Santa Monica Bay. Scientists staved off its extinction for years by nursing or monitoring it at three sites off-limits to the public at Los Angeles International Airport, the Chevron El Segundo refinery, and on private land in Torrance. They estimate the population remains low -- only in the tens of thousands -- with the largest group at the airport. Now, the butterflies seem to be declaring independence. They forged ahead on their own to reach new native vegetation at the two beaches. There they are mating and feasting on the buckwheat nectar they crave. That proved wrong the biologists who called the species too sedentary to fly long distances. "They were so, 'It's not going to happen,' " recalled Monica Acosta, a horticulturalist. Then, a few weeks ago, she visited the Redondo Beach site where corps workers recently added native plants. Something moved amid the shrubs. "That's when I noticed this little blue flicker," she said. 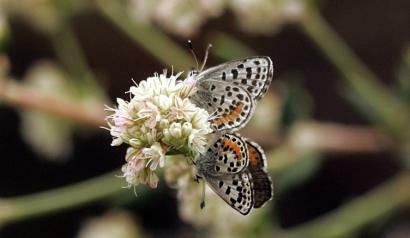 She snapped some photos and turned them over to butterfly experts to study. Two days later, it happened again. In just one hour in late June, an independent biologist counted 238 El Segundo blues at the two sites. He advised the US Fish and Wildlife Service the next day that the discovery proved that the butterfly has the "capacity for rapid establishment." A federal spokeswoman, however, said that she knew of no other spot in Southern California where beachgoers can mingle with federally listed butterflies. This success story was led by a team of residents and two nonprofits, the Urban Wildlands Group and the Los Angeles Conservation Corps' Lab program. They used a simple formula: Pull out the ice plant, put in the buckwheat. Starting in 2004, they stripped thick green carpets of non-native ice plant from small areas on beach bluffs. Month after month, they restored the scrub plants that flourished here centuries ago: lupines, prickly pear cactus, ambrosia, and, of course, buckwheat. In the old days the butterfly thrived in the sand dune system. Builders carved the dunes into pieces with construction of waterfront homes, the Chevron oil refinery, the Hyperion sewage plant, and the Los Angeles International Airport. They laced the sand with ice plant, which crowded out native plants. The El Segundo blue continued to ebb away, even after federal officials protected it in 1976 under the Endangered Species Act. By 1998, it existed in only three spots: the dunes west of the airport, the Chevron refinery, and the Malaga Cove area. Airport and refinery launched recovery efforts, and scientists estimate that several thousand live at the two sites.